Happy 4th of July to All! Hope you all have had a nice spring and are enjoying the summer weather despite these temps in the 90s. Things have been busy here but we’ve also had some great time to get away here and there. After getting all the buckets washed and evaporator cleaned up at the end of the season we had the chance to go ride the Lamoille Rail Trail in Morrisville Vermont. Nice easy riding and beautiful country. On the one rainy day we had, we went to the Shelburne Museum. A place we hadn’t been in over 30 years. It was great to see all the history there. 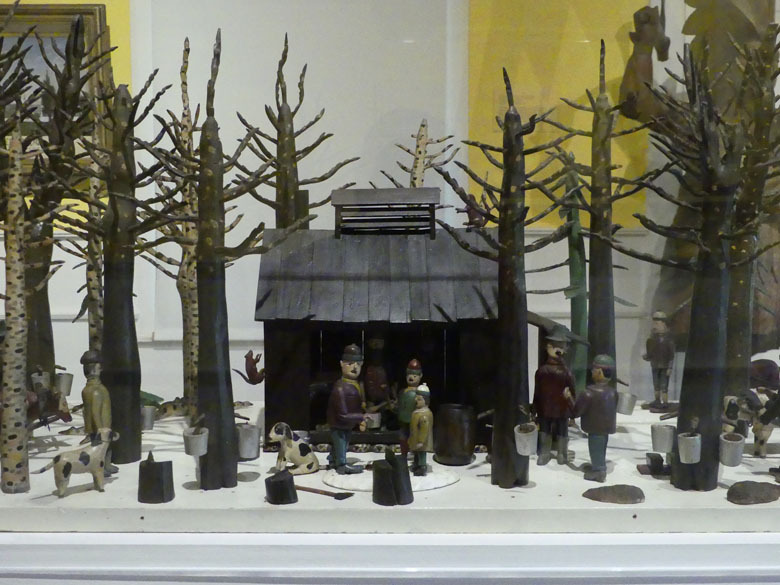 One item of special interest was the Folk Art Sugar Camp diorama. You don’t see many maple folk art around anymore. Hope you all have been having a good summer. We’ve been busy with markets and the garden. On August 10th we welcomed the arrival of our 3rd grandchild, a little girl named Allie. And we went on vacation Aug 20th to Quebec. Tadoussac, Quebec is a location actually better well known in Europe than NH for whale watching. It’s a fabulous place. There is a coastal route along the St. Lawrence river called the Whale Route where you can find places to watch whales from land. The unique thing about this town is it’s location at the mouth of the Saguenay fjord. The rich water from the fjord mixing with the water in the St. Lawrence makes for abundant feed for whales and other ocean life. Within the first 2 hours in town we went to a location called the ‘Dunes’ which looks down on the bay and we saw a humpback who the locals have named Blizzard. The next day we went out on a whale watch in a mid-sized zodiac. Within 10 minutes we were watching Minke whales surfacing, a group of about 150-200 grey seals feeding and Northern Gannets diving out of the sky into the water after fish. It was awesome. Over the next 2 1/2 hours we saw more Minkes, the humpback Blizzard, at least 2 different blue whales (yes they are the biggest ones! ), harbor porpoises and a mother and calf Finback whale and a Beluga whale. The St. Lawrence and Saguenay fjord are home to a population of the white whales year round. We also got to see many of them in the fjord waters and the morning of our departure from the B&B in Tadoussac where we were staying. At 7 am we were having our last breakfast and 4 belugas came into the river mouth because of the change in the tides to feed. So we were able to watch them while eating breakfast. Not bad! Later on our travels we also spotted a Pilot whale off the coast of the Gaspe peninsula on our way to Perce. It was just the kind of vacation we were looking for. Had perfect weather everyday, camped a couple of times during the week and got to see some beautiful areas in Quebec and through New Brunswick and northern Maine on our way home. This area is surprisingly close. It’s an easy 2 day drive but can be made in one day of you are used to long drives.